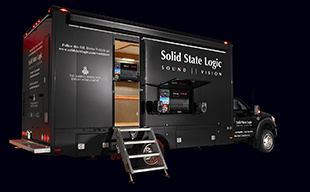 LAS VEGAS – Solid State Logic, the world’s leading provider of tools for creative audio professionals, is demonstrating how IP Audio Networking can deliver significant feature benefits and cost optimisation in audio routing systems for broadcast production at the 2014 NAB Show (Booth C2317). The insightful demonstration serves as a launch for SSL’s new ‘Network I/O’ broadcast audio interface range and shows how the new product line and SSL digital broadcast consoles can be elegantly interfaced with devices from more than 75 different manufacturers using a Dante IP Audio Network. The new SSL Network I/O range consists of ‘MADI-Bridge', providing 64 bidirectional channels of fully redundant MADI-to-network bridging with front panel confidence headphone monitoring; ‘SDI', bridging eight 3G-SDI embedders and eight de-embedders to the network or MADI with internal per channel routing; and ‘Stagebox’, which provides eight channels of mic/line I/O (using SSL’s renowned SuperAnalogue™ mic pres) with redundant network connectivity. The demonstration includes four SSL consoles (2 x C10, C100 and Live) networked with third-party devices from Shure and Sound Devices and also features SSL’s ‘LMS-16’ Loudness Monitoring system connected directly to the network. With Dante committed to conform with AVB standards and with AES67, the SSL Network I/O range is ready for future networked audio developments. Audinate’s Dante technology is well established in professional audio for live production and installation sectors, with more than 200 devices from over 75 different manufacturers already available. The demonstration at NAB sets out a very strong case for why Dante is the right choice for forward-thinking audio routing for broadcast production applications. Dante uses IP networking. The backbone of IT infrastructures worldwide, IP networking is a lower cost technology that benefits from developments and cost competition in much larger industries than broadcasting. Cat 5, Cat 6, fibre cabling and off-the-shelf network switch hardware come at a fraction of the cost of comparable TDM-based solutions and are guaranteed to be supported by international standards and major manufacturers. IP networks are scalable and can be grown easily as budgets and needs require. In addition to transporting audio, they can also support other data traffic pertinent to the workflow. The function of routing, so expensive and complex to implement in TDM systems, can be accomplished using standard network switch hardware and conventionally managed router software. Ethernet/IP connectivity simplifies the interfacing to a range of other systems such as Intercoms and Station Automation. Network switches with industry-standard redundancy protocols are readily available and enable IP-based networks to meet the highest levels of redundancy demanded by Broadcasters. SSL chose to utilise Audinate’s Dante Technology because it meets their technical requirements and has the critical mass that other solutions can’t match. Developed using existing standards, including IEEE and IETF, Dante is deployable on any standard IP infrastructure and can share networks with other types of traffic. A key factor in SSL’s decision was Audinate’s commitment to converge with the AVB standards and to conform with AES67. These clear migration paths mean investment today is future-proof and a single device will be able to function in any of these environments. Audinate’s clearly defined device discovery mechanism also means any device is plug-and-play, and network standards allow you to tailor your infrastructure to define if you want this to be the case. High Channel Counts: 512ch @ 48kHz (256 @ 96kHz) on a single 1GB connection. Guaranteed Interoperability: plug-and-play discoverability of 200 devices from 75 different manufacturers – and growing. Remote Device Control: parameters configured anywhere on the network. Reduced Cost: standard low cost IT hardware, standard and/or existing Cat 5 or Cat 6 cabling with audio and control on the same network down a single cable. Simplified Interconnectivity: Ethernet/IP connectivity simplifies interfacing with a wide range of devices, including Intercoms and Station Automation. Full Network Redundancy: technology tried-and-tested across many industries and fully compatible with all network redundancy models. Distributed Routing Control: routing control from unlimited devices or terminals. Absolute Resilience: catastrophic failure of a single device will have no effect on any other devices in the network. Standards compliant: IEEE and IETF compliant, thus deployable on and can mix with traffic on any standard IP infrastructure. Committed to converge with AVB standards and conform with AES67. ‘MADI-Bridge’ provides an interface between a Dante IP Audio Network and MADI. With 64 channels per Bridge (@ 48kHz), redundant MADI, IP Network ports and PSU, the Bridge is built for un-interrupted fully redundant operation. In addition to the built-in clock redundancy in Dante controller, the MADI-Bridge includes a pair of sync inputs for use as a self-redundant Dante Grand Master clock. MADI-Bridge also features a front panel headphone socket (with rotary level control) and built-in headphone monitor routing, to truly replace traditional patch bay routing and fault-finding functionality with equivalents in the IP Audio domain. GPIO connections allow for transfer of tally info and switching functions across the network with the Audio. ‘SDI’ provides bidirectional bridging between Embedded SDI Audio and a Dante IP Audio Network. Eight 3G-SDI Embedders and eight SDI De-Embedders provide up to 256 channels of SDI connectivity and the unit has dual Dante and triple MADI connectivity (2 x optical, 1 x coax I/O). In addition to SDI-Dante bridging SDI allows direct bridging between SDI and MADI infrastructure. Internal channel-by-channel routing enables flexible routing between all three domains. As you would expect redundant PSUs provide reassurance in a 24-hour Broadcast environment. A Mic/Line Network I/O device for use on any Broadcast Studio floor, ‘Stagebox’ brings SSL’s renowned SuperAnalogue™ pre-amp design to the interoperable IP Audio Network market. With eight Mic/Line inputs, eight Line outputs and a pair of redundant network connections, Stagebox allows easy deployment of mic pres and speaker feeds where needed in a Studio. The Network I/O’s plug-and-play feature allows devices to easily be moved, even between studios and retain routing and settings if required. Clear signal present, phantom power and local attention LEDs provide intuitive front panel feedback.